Would You Wear… a Dressy Romper? Rompers are getting a formal update. Color us obsessed. If you associate rompers with festival attire and breezy summertime style, you’re like most of us. However, some of the fashion elite have begun dressing up the naturally casual romper and we could not be more in love with this look. When created with a structured fabric, lace, or long sleeves, the romper instantly becomes going-out material. With high heels and a glam necklace, this look works perfectly for a night on the town. Would you rock a romper as eveningwear? We love the look for a night out with your girls, but would you wear one? If so, how would you rock it? 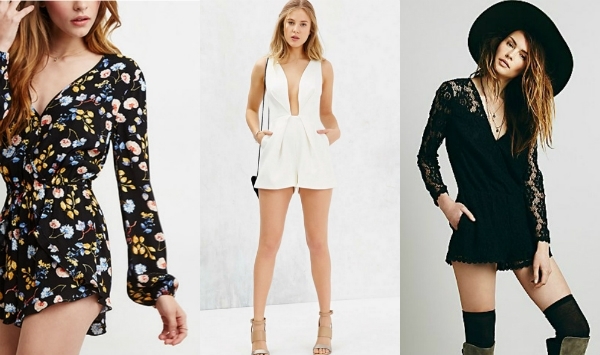 Which of the rompers pictured above is your favorite? Share your thoughts below! Tags : formalwear, rompers, Summer 2015, Would You Wear? Next Would You Wear… a Low-Back Dress or Shirt?